Ever since I relocated from Seattle to Los Angeles, nearly 2 years ago now, I have relied more than ever on container gardening. With a confounding, on-again, off-again irrigation system that will cost the equivalent of a year’s grad-school tuition to completely repair, and with rock-hard soil that endured years smothered by the previous owner’s idea of weed control (black plastic sheeting covered with red lava rock “mulch”), I’m desperate to grow plants in spite of unwelcome conditions. But where? 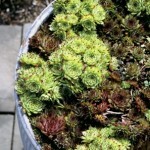 And how to keep them alive when it’s too hot and dry for anything but succulents to look good? 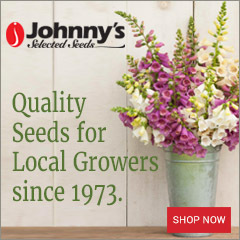 Why grow a container garden? 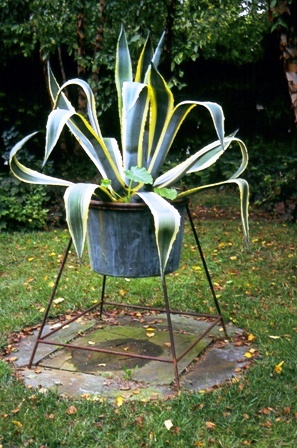 Move plants and architectural interest above the ground’s surface: You’ll enjoy beauty closer to eye level, as in this cool vintage vessel that caught my eye at Chanticleer Gardens in Pennsylvania (2006). 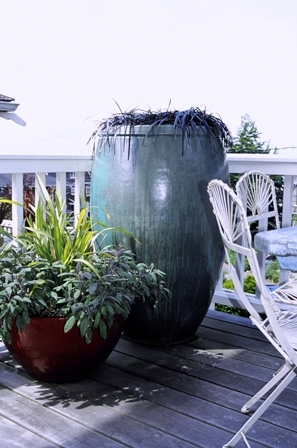 Edible and Accessible: Lettuces and herbs thrive in pots, like this over-sized terracotta “strawberry” pot at right – measuring 48 inches tall, created several years ago by the designers at Emery’s Garden in Lynnwood, Wash.! 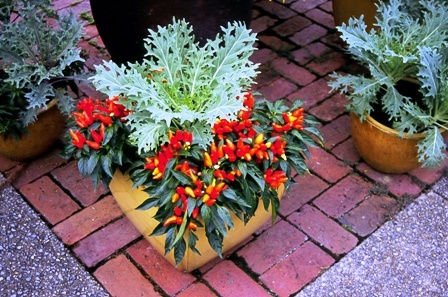 At left, ornamental peppers and kale in a pot at Longwood Gardens are food for the eyes. 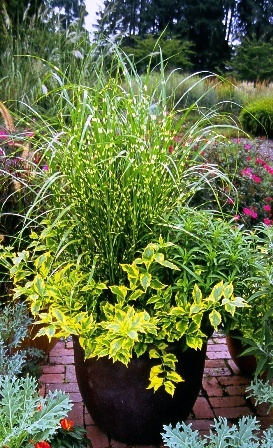 Define a focal point: Signal the entrance to the garden, such as with these two glossy Asian pots that contain lush golden hostas. Mounted on pillars, they announce: “Come this way,” a way that’s made more enjoyable because this portal leads to the gardens of David Lewis and George Little, Bainbridge Island artists. 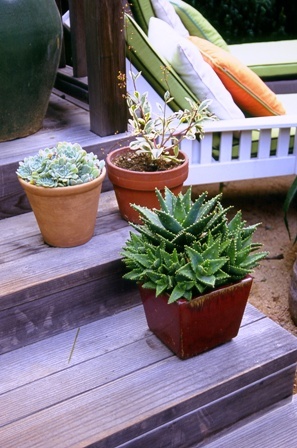 Provide a natural perimeter: Anywhere in the garden, such as at the edge of a deck or patio, pots can act as a verdant “wall” to contain, deter, protect or enclose. 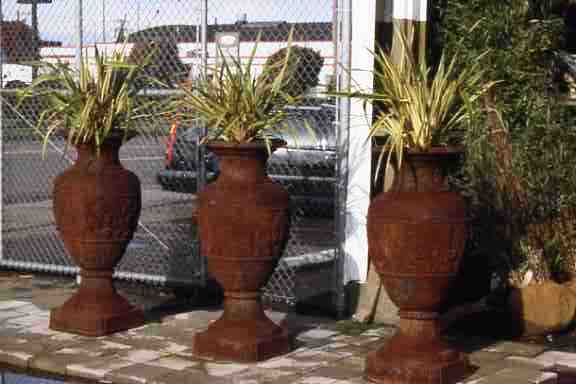 I particularly enjoy seeing three identical pots, lined up as a formal barrier – it’s plant-filled architectural interest. 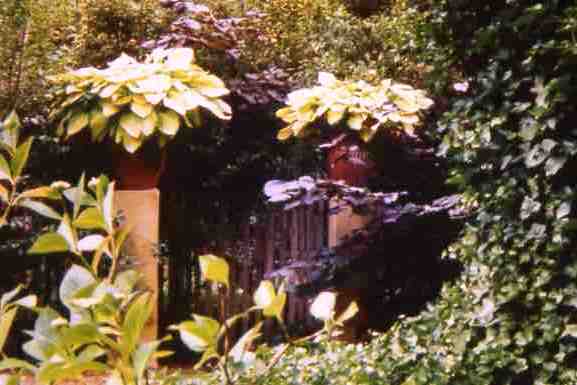 Here, at the edge of Peter Norris Home & Garden’s parking lot, these giant iron urns hold gold-streaked phormiums (left). 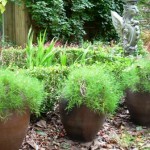 A trio of fern-filled pots defines the edge of a formal planting scheme at Robert Dash’s Madoo Garden (right). 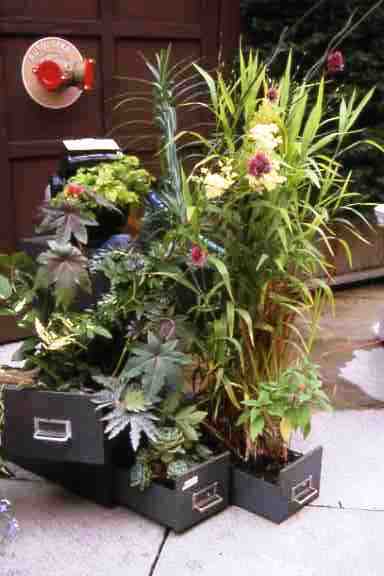 Containers add flexibility to your garden design because you can move them around. That task is made easier if your heavier containers are on movable saucers, i.e., “Plants on Wheels.” Such groupings enhance the strengths and mask weaknesses of the garden. 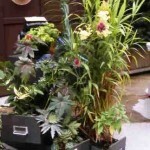 You can use a container to showcase a collector’s plant or perhaps, as is the case for me, pamper a plant that isn’t quite ready for the harsh realities of the climate you’re in. Here, in Zone 10, that means keeping a hydrangea happy. Back in Seattle, Zone 8, it meant keeping an echeveria happy! Funny how that works. 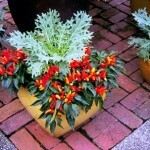 I like to call another cool container idea “Singular Sensation,” as in one plant-one pot (or, many of one plant in one pot). If you’re going for a textural or sculptural effect, this is the style for you. 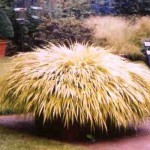 Ornamental grasses, such as purple fountain grass or Japanese hako grass, are so dramatic when planted by themselves in a container. 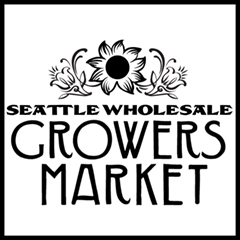 The design at left was created by Tim Moshier of Cambium Landscape Architecture in Seattle. 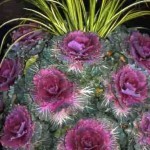 Collect similar plants, such as coleus, heucheras or sedums, in a container for a tapestry-style design. 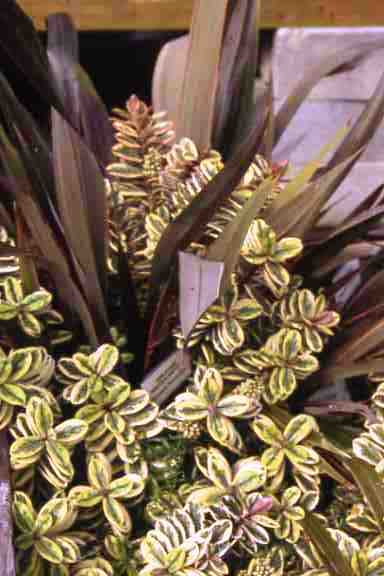 The eye is drawn to the overall texture, and then each single plant’s leaf color or unique foliage patterning pops out! 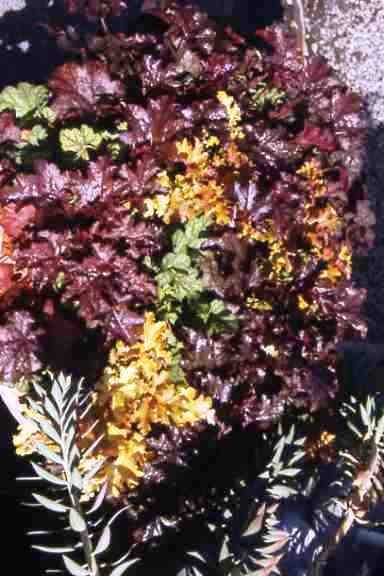 The heuchera design shown here is from Swanson’s Nursery (Seattle); the sempervirens in a pot was created by Carina Langstraat and Erik Wood of Langstraat-Wood Landscape Architecture (Seattle). 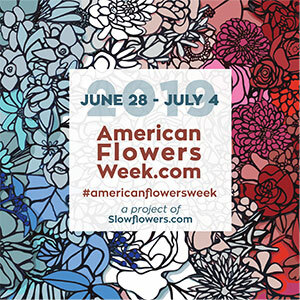 When the garden is in its quiet phase, such a between flushes of roses, or in the hottest months of July and August, containers offer you a chance for continual color. This can also be described as “instant gratification” because potted gardens often do what the rest of your garden isn’t able to. 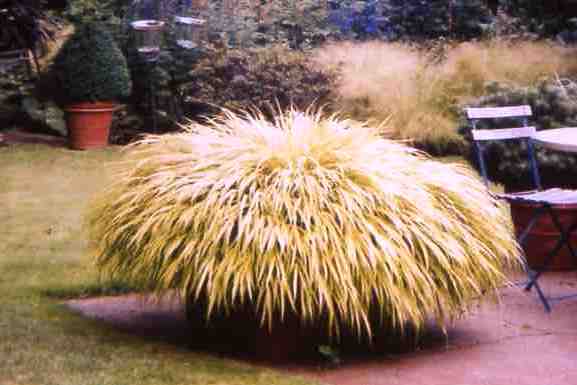 I loved this outrageous topiary-style mound of ornamental cabbage, tufted at top with a lemon-lime burst of Japanese sweet flag (Acorus gramineus) – from Wells Medina Nursery in Medina, Wash. Another visual color treat: Phormium paired with hebe ‘Quicksilver’ and one of the brilliant heathers of summer, perhaps Calluna vulgaris ‘Wickwar Flame’ (from Swanson’s Nursery). 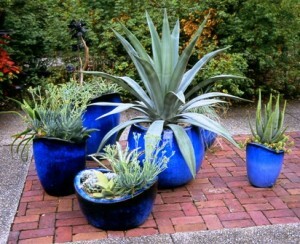 Don’t forget the artistry of pots: Show off your style! Sometimes, it’s more about the drama and scale of the pot than about what you’ve planted in it. 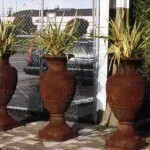 This is when your Ali Baba-sized containers can lend stature to the corner of a deck, patio, front porch or terrace. This is another Langstraat-Wood creation. 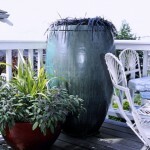 Isn’t it cool how the enormous verdigris-glazed urn is “topped” with a mop of black mondo grass? 1. Start with a Tall focal element, such as a columnar plant, an ornamental grass, or even a trellis in a pot on which a vine will climb. Ilex ‘Sky Sentry’ is a good choice. 2. 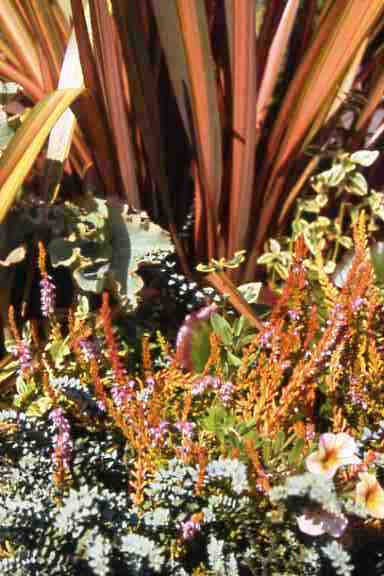 Use mid-range plants for texture, color and foliage. These are the hard-working supporting actors in a pot. I love using variegated plants that pick up on the solid colors of the taller or trailing elements. 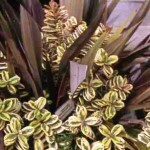 Here (left) is a tricolor hebe, beautifully clustered around the base of a burgundy phormium. Delicious! 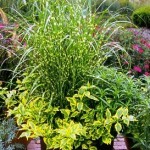 At right, the lemon-green variegation of the mid-range plant echoes the lemon stripes on the blades of a tall grass. 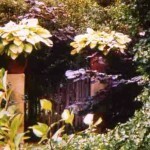 Left pot: Swanson’s Nursery; right pot: Longwood gardens. 3. 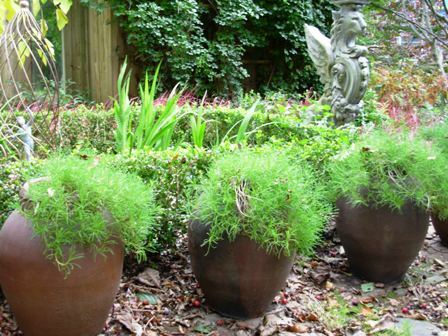 Select trailing plants to soften the design and spill like fringe or tassels over the container’s edge. Never use predictable plants when you can choose from so many other varieties (ie, use fancy-leafed geraniums instead of plain-old green ones). 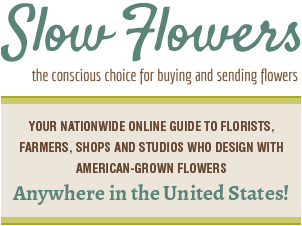 I like to quote the ever-so-snobby (but delightful) Vancouver, B.C., garden designer and nursery owner Thomas Hobbs. In his wonderful book, “The Jewel Box Garden,” Hobbs takes on prosaic plant choices, such as bacopa. He describes this typical trailing plant as the “horticultural equivalent of white icicle lights” that people hang from their front porches at Christmastime. His favorite alternatives to bacopa? 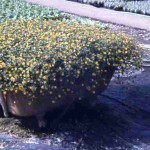 Among other things, he loves to use Senecio rowleyanus ‘String of Pearls’ or Dichondra argentea ‘Silver Falls’. 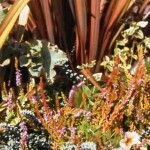 Plant “mix” should be 70% structural plants or perennials + 30% seasonal plants. 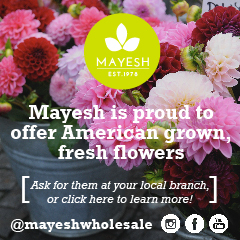 Seasonal plants don’t necessarily have to be annuals, but bulbs, tender perennials (begonias, fuchsias) or herbs. 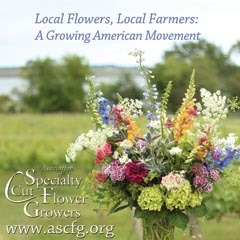 For best variety, design your container with a specific season in mind: Early Spring, Summer, Fall/Winter are good ones to shoot for. 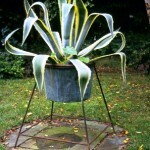 Don’t let your pots go dormant in the winter. Add something for interest even it it’s an ornamental “rust” art piece, berries/twigs, a bird nest, etc. 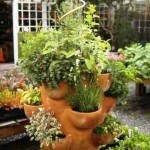 To lighten the load, especially of a large pot, fill 1/3 of your pot with something that helps displace excess soil. I like to use upside-down black plastic pots (we all have lots of those!). Gravel is too heavy. Soil recipe: 1/3 planting compost + 2/3 fresh good-quality potting soil. When replanting seasonally, refresh soil with more planting compost. 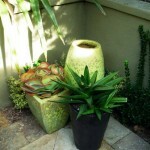 When renovating an old pot, start over with all new soil. 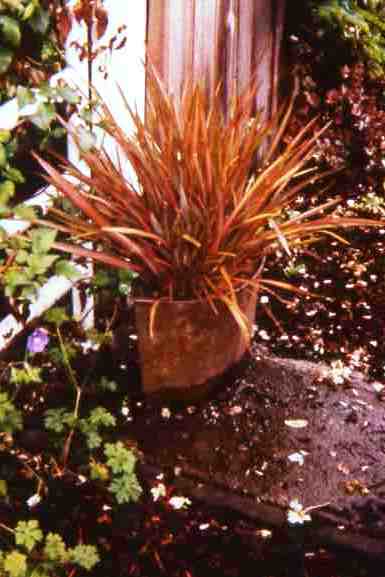 If you’re working with very large pots and it’s impossible to remove all the soil, check for problem signs on existing plants. If everything looks healthy, just remove the top 1/3 of soil and replace w/above mixture . 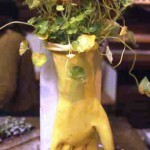 . . and plant away! 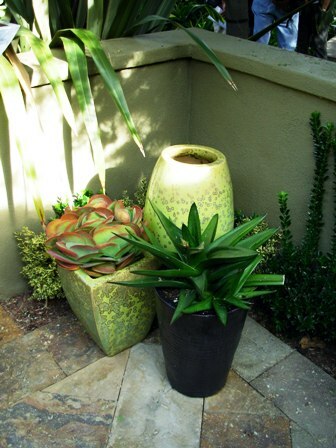 When your pot is in full sun or you can’t water often, use a soil polymer in the mix for water retention. 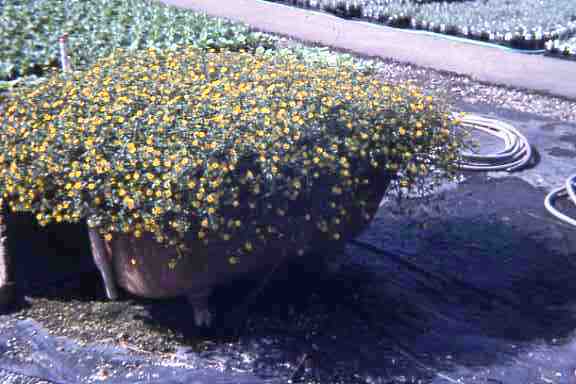 STUFF the pot, ignoring the “mature size” on the plant label. There will be plenty of soil for your crowded plants, and since they are regularly fertilized, they’ll be fine. 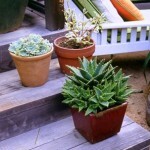 Otherwise, you’ll have lonely-looking plants for the first ½ of the season. 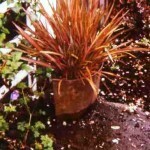 Watch out for dark-colored pots in full sun. They’ll bake your plants. It’s okay to mix some sun plants with shade plants if you don’t care about blooms. 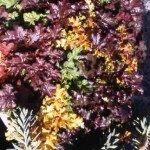 If you have great leaf texture and color, they can make for a winning design. Each time you water (usually daily during hot months) use diluted water-soluble fertilizer like Peters Professional or Miracle-Gro. 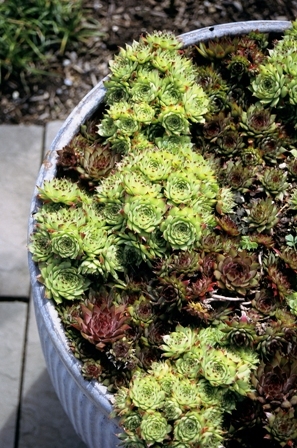 This tip doesn’t apply to succulents, which you only need to water occasionally. Deadhead frequently and watch for pests. 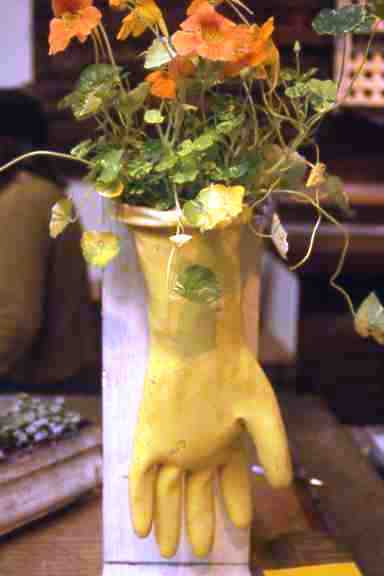 Nasturiums-in-a-kitchen glove. Hopefully, the fingertips have a few drainage holes poked in them. This design was mounted from a wire loop-style bracket. Perfect to hang just outside the kitchen window where you stand to do the dishes! C’mon Baby Light my Fire. Here’s a perfect solution for the old hibachi grill! Plant a few flame-orange and fiery-red Celosias inside. 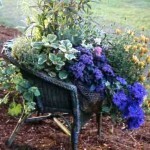 Don’t forget to add charcoal briquettes as “mulch.” Cute for a patio, n’est ce pas? Downsized office workers will find a new use for file drawers! 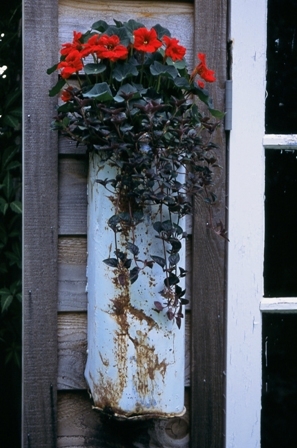 An alternating stack of recycled metal drawers makes for a creative plant tower. A mixed annual design, spilling from a reclaimed wicker armchair. 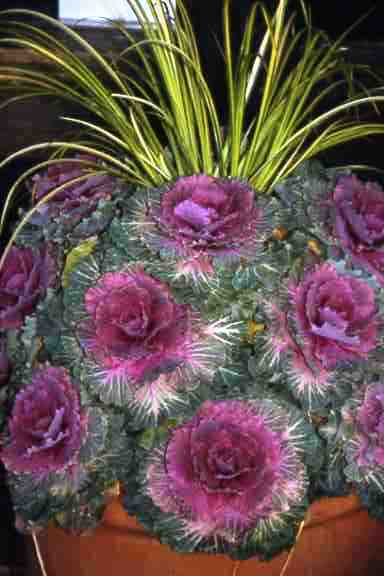 This caught my eye at the Van Dusen Flower Show several years ago. What to do with an old clawfoot tub? Fill it with annuals! From Henry’s Plant Farm in Snohomish, Wash. 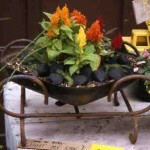 This entry was posted on Monday, August 4th, 2008 at 9:36 am	and is filed under Creativity, Gardening, Plants, Playfulness. You can follow any responses to this entry through the RSS 2.0 feed. You can leave a response, or trackback from your own site. The “C’mon Baby Light My Fire” was my favorite. 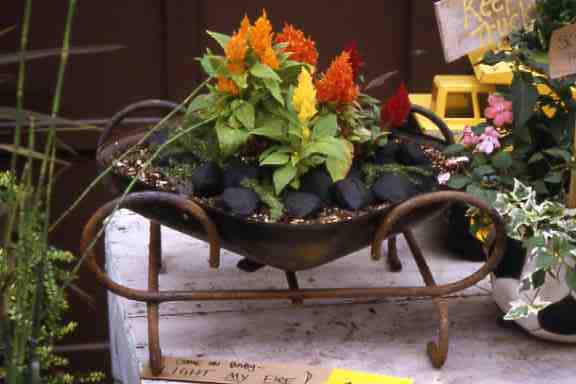 A great container idea, in fact I’m kicking myself for throwing away a grill just like the one you used. 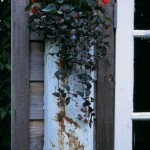 Love seeing a blog on garden ornamentation. People seem to forget what a touch can add to their own! 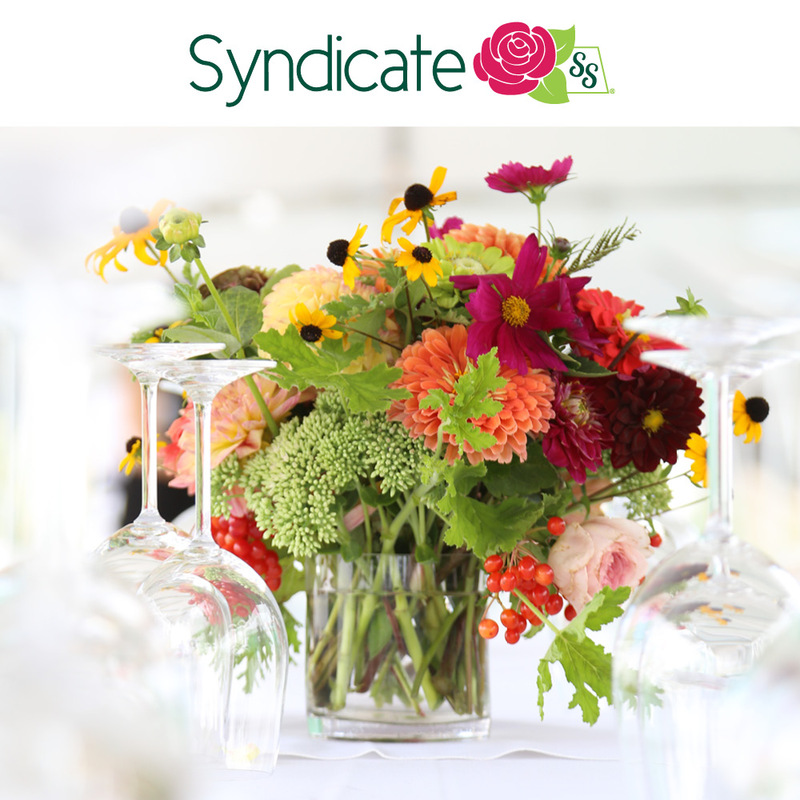 Have a look at our website….possible too traditional for you, but you may find it of interest! I just started to get really into container planting on my patio. Before, I used containers in the yard because of poor soil or too many roots from a nearby birch tree. 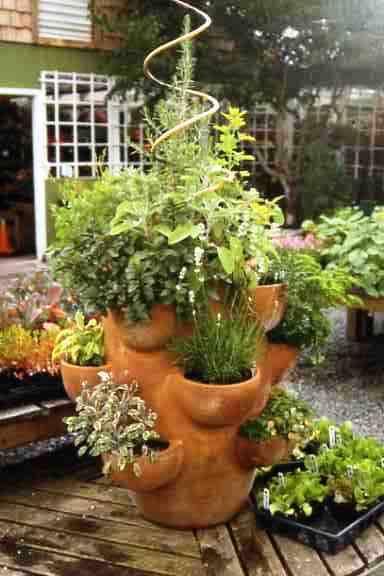 Now we grow veggies in pots and other ornamentals. 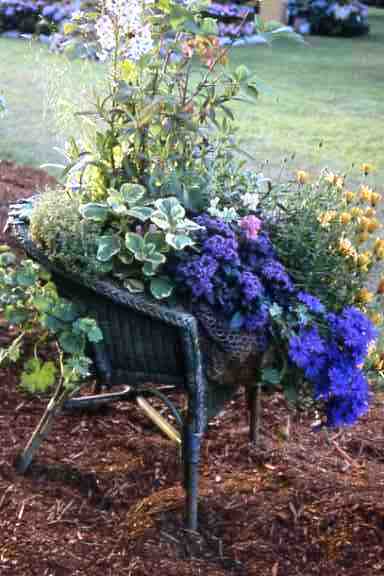 My hope is to create a Mediterranean look with grasses, succulents, and herbs. BTW, discovered your blog on Twitter. 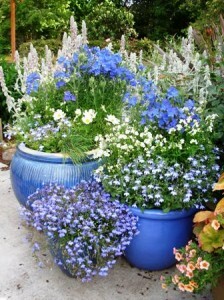 I once read that everything looks better in a blue pot. Your first two photos prove it! Thank you for sharing.